If you are not familiar with keywords, we suggest you read our guide on them before reading this. Negative keywords work in the opposite way to keywords, instead of triggering ads, they prevents from being triggered (shown). In many other respects negative keywords work in the same way as keywords, we discuss how they work and why they are essential in most accounts in this guide. Using negative keywords helps to improve CTR through reducing the number of impressions, which has a desirable impact on things like Quality Score, which affect overall account performance. More than simply improving other metrics, they also help to limit the triggering of your ads to only those searches that are relevant to your keywords. For people new to AdWords; Google set the default match type of keywords to ‘broad match’ and this is often not changed to a more appropriate match type. Consequently in this scenario, a range of low relevance to irrelevant search terms will be triggering ads. This can still result in Clicks that you pay for, which often result in poor engagement and conversion rates. So to avoid low quality traffic and poor CTR, Quality Score and consequently higher CPC’s and lower Ad Rank, implementing negative keywords is essential. The only scenario where not using negative keywords would be appropriate would be in accounts, which use only Exact Match Keywords on the Search Network. Unlike ‘keywords’, negative keywords have very few components and attributes as they perform a singular function in a simple way. We discuss this in more detail in the section below, but all negative keywords have a match type. If removed, right clicking on it in AdWords Editor and selecting “revert” from the menu will enable a negative keyword. Negative keywords are most commonly used in Search campaigns but they can also be used in Display campaigns. Below, we discuss how usage on the two networks differs. On the search network negative keywords prevent ads from being triggered (based on match type) when they are present in search terms. Display network keywords are matched to web page content rather than search terms and hence negative keywords on the Display Network restrict the triggering of ads when the negative keywords appear on webpages. This is less of an exact science as Google is trying to match content with keywords and not negative keywords. A more common way of restricting ads once you have some data is to use negative placements. These work in much the same way as keyword match types, but rather than triggering ads, they prevents ads from being triggered based on the match type. The concepts underpinning this are the same, Google needs to match a negative keyword to a search term and they provide several ways to go about facilitating this. Exact match negative keywords prevent ads from triggering is someone searches for something (more or less) exactly as you have defined it. For example, if you add the keyword ‘blue dresses’ to an ad group, none of the ads will be triggered if someone searches for “blue dresses”. This will not include misspelling and pluralisation of the negative keyword. Consequently this is a very limited restriction of ads, someone searching for ‘formal blue dresses’ would still allow an ad to be triggered in this example. Negative keywords set to phrase match will typically prevent ads from being triggered more often than with exact match but less than with broad match. Because phrase match strikes a nice compromise between highly specific and very unspecific, they are very powerful and highly effective at limiting unwanted ad exposure. Phrase match negative keywords prevent ads from being triggered when the phrase match negative keyword appears within the search term. For example, if you added ‘blue dresses’ as a phrase match negative keyword, this would prevent ads from being triggered for any term that contained those words in that order. This will not include misspelling and pluralisation of the negative keyword. 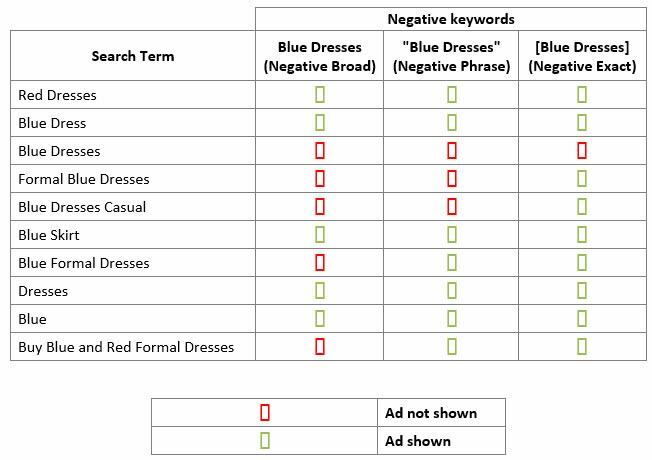 Unlike exact match negative keywords this would prevent ‘formal blue dresses’ from triggering an ad. Thus more caution is required, because adding a single word, as a negative keyword will prevent ads from showing if that word occurs anywhere within a search term. Continuing the example, adding ‘blue dresses’ as a phrase match negative keyword would not prevent ads from triggering if someone searched for ‘blue formal dresses’. This match type will not include misspelling and pluralisation of the negative keyword. Broad match negative keywords do not use either brackets or quotation marks, but are uploaded ‘as is’. This match type is unfortunately not currently available for negative keywords. The default match type for negative keywords is broad match. There is a limit on how many negative keywords can be added to a campaign or an ad group, these are reachable limits in some cases but it is not commonplace. Around 10,000 negative keywords can be added to a campaign (at campaign level) at the most. Ad Groups can have up to 20,000 targeting components (keyword, Placements and audience lists), Google don’t make it clear how many negative keywords can be added or if they included in this figure... We have tested this and found that we had no problem adding 10,000 negative keywords at the ad group level. However, Google have provided us with the shared library and in that we find ‘negative keyword lists’. These are only available online, so you cannot add or build them through AdWords Editor. These lists can hold more negative keywords, they can be applied to multiple campaigns, but more importantly campaigns can have multiple lists applied to them. Google say that you can have up to 5,000 negative keywords per list and up to 20 lists, however we have tested this and found that we can create lists with up to 10,000 keywords per list. This means that any one campaign can have around 210,000 negative keywords at campaign level, which should be more than enough! If this is not enough, consider changing the structure of the campaigns... Given that you can have up to 20,000 ad groups per campaign, each with 10,000 negative keywords in addition to 10,000 at campaign level and 200,000 in Lists, there is more than enough facility to accommodate your negative keyword needs! You can add negative keywords at either the campaign of ad group level. When added at the campaign level they will affect all keywords contained in the campaign to which they are added. If added at ad group level, they will affect all keywords contained in the ad group to which they are added. Adding negative keywords at campaign level is typically done when the negative keywords are not going to conflict with keywords in the campaign. For example adding “free” as a negative keyword to a Search Network campaign in order to prevent ads from being triggered by people using the word “free” in their search term is a commonplace tactic. This is far from a hard and fast rule, if you are managing the AdWords account for a recruiter, you will not want to go ahead and add “job”, “career”, “hire” etc as negative keywords! It is very commonplace to add all of the keywords from other campaigns to a campaign (at campaign level), to prevent one search term from being able to trigger more than one ad from different campaigns. We discuss this strategy in more detail in a guide on account structure, as this is pivotal to how accounts are structured. If each of the above represents an ad group containing a handful of closely related keywords, you may want to limit the triggering of ads at ad group level to force the most relevant ad to show. For example, adding the negative keyword “blue” to the ‘red dresses’ ad group would prevent the ads in the ad group from being triggered when someone uses the word ‘blue’ within the search term. You can probably see why this would not be appropriate to do at campaign level, because ads in the ad group containing the keywords related to ‘blue dresses’ would be prevented from being shown. Therefore, adding negative keywords at the ad group level is done when adding the same negative keyword at the campaign level would conflict with keywords in ad groups. To find out how to add negative keywords to AdWords, please follow the link.